Germany and France have opened a new bridge outside the French border city of Strasbourg as part of an ambitious high-speed rail network to span the EU. German and French trains symbolically passed each other on the bridge at Kehl, the German town which faces Strasbourg across the Rhine. The old single-track bridge allowed a top speed of 100km/h (62mph) but the new double-track bridge allows 160km/h. It will eventually form part of a high-speed link from Paris to Bratislava. German Transport Minister Peter Ramsauer described the bridge as a "milestone for high-speed rail in Europe", German broadcaster SWR reported. His French counterpart, Thierry Mariani, said it was a "symbol of Franco-German friendship and Europe growing together". 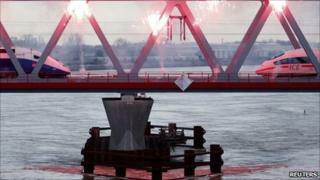 The 239m (785ft) steel bridge took three years to build at a cost of 63m euros (£53m, $84m).